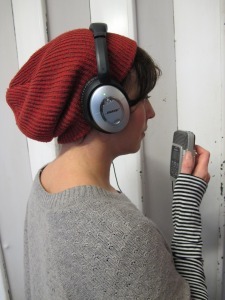 Elle Osborne has been developing her sound installation, Stand Apart, over the past year. Elle wanted to work with young women about being heard and not heard and ran a number of workshops to create her final work. Stand Apart is available to view at Fabrica on Thursday 22 January 6-9pm. Making Space projects take place outside of the main gallery programme at Fabrica. Artists can make a proposal to try a new piece of work out in the gallery space, where the public can view for an evening event, discussion event or open up as a studio as part of the project. Past projects have included a Contemporary Cave painting by Thomas Allen, Ellen Southern and Claire Whistler developed their sound and performance piece Creeping Buttercup and Joseph Young developed his performance and sound installation The Ballad of Skinny Lattes and Vintage Clothing. There are approximately two opportunities per year, plus the Testbed that takes places in September during the Brighton Digital Festival. This entry was posted in sound art and tagged Fabrica gallery, residency, sound art, visual art. Bookmark the permalink. Reblogged this on Bass Shaker Presley.